Sheesh, I had every intention of getting this post up early today, but then my internet decided to go haywire for about 7 hours :( grrrr. Sorry for the delay! 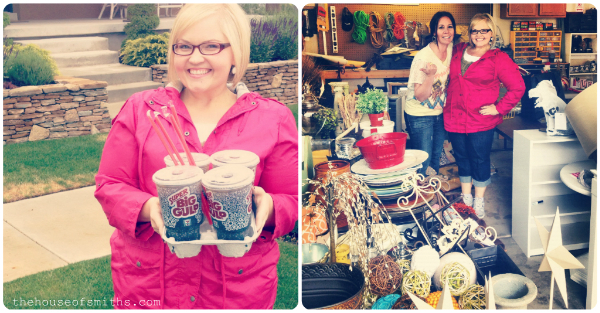 THANK YOU, THANK YOU, THANK YOU to everyone who showed up for our garage sale this past Saturday!!! It was a HIT! 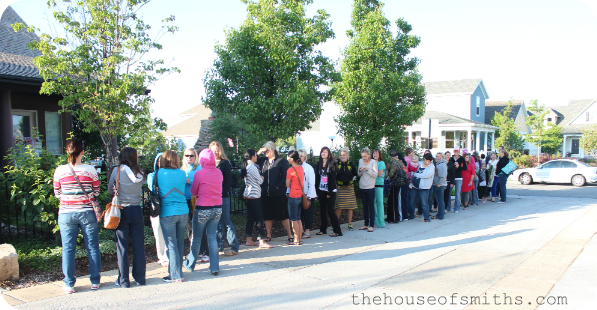 I have to say that I was literally shaking with fear, nerves and excitement from about 6:45 (when the first few ladies arrived) all the way till 7:30, when we opened the back gate and garage door to let everyone in. The prep work for this crazy garage sale started... well, months ago... but really didn't get moving until Thursday night. We could have used another week to get ready, but 2 days was gonna have to do. Whew! You'd think that the "hard stuff" was out of the way, but nope!... it was just beginning. 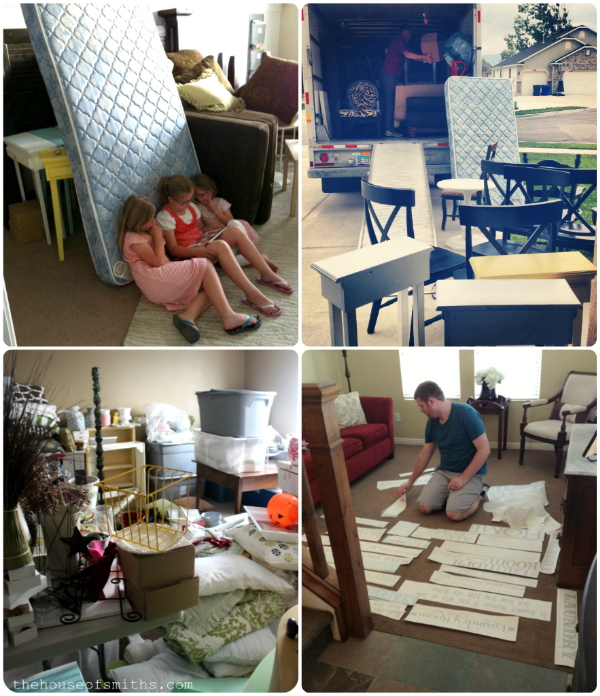 Once we unloaded everything at my parents house, we quickly realized how MUCH stuff we had to still sort through, dust, organize and price! Thank goodness for my cute friend Mandy from Hoop La earrings, she totally saved the day! I provided the energy... (aka: Diet Dr. Pepper), Mandy brought poster board and markers, and we worked our tails off all day long on Friday, getting everything ready. Between only about 3 hours of restless sleep and being so nervous about everyone coming, I totally forgot to take more pictures of the entire set up in the garage, BEFORE it was all swiped up... (dang it!) but from the above picture of Mandy and I, you get the idea. ha! After quickly slipping out to take a few snapshots of the crazy line, that started at the back of my parents house, and wrapped all the way around the side... 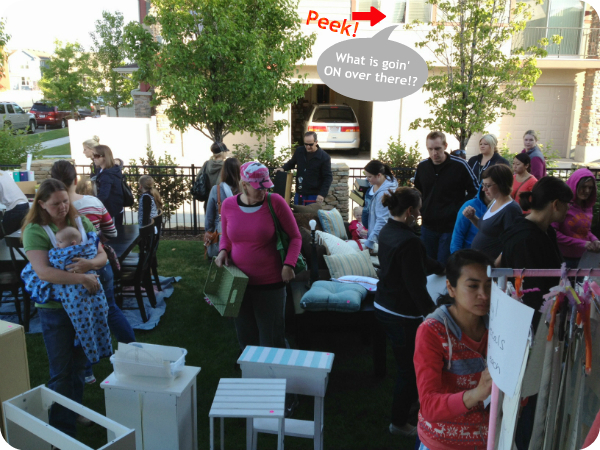 I said a quick hello, explained how things were going to work, and let those awesome garage sale-ers through!!! I guess we caused quite a riot, because I noticed later in this picture below, a curious neighbor peeking out behind some blinds to see what all the hustle and bustle was about. haha! Once people swiped up their goods, Cason, my Mom and I checked everyone out as quickly as possible, gave lots of hugs (which sounds weird at a garage sale, but I promise it wasn't. ha!) and wished everyone the best of luck with the rest of their garage sale hunting that day. Everything went by SO fast, and by 10:45 we had virtually sold almost everything! 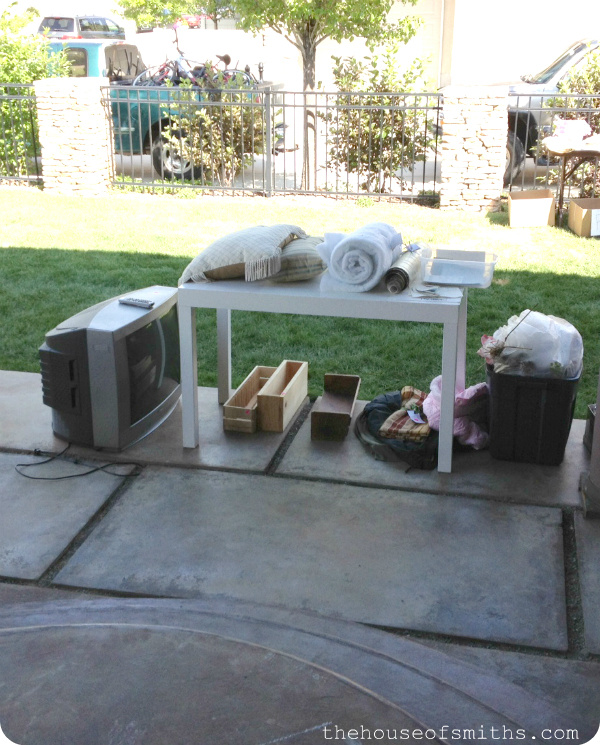 A couple of pillows, some Christmas decorations and an old TV were pretty much the only things left, out of an entire garage AND yard full of stuff! Seriously, you guys ROCKED our world! I was so incredibly touched by how many of you showed up and supported us, or just even stopped by to wish us luck that day and in the future, with our blog. We had readers come from Idaho, Colorado and even Washington!!! 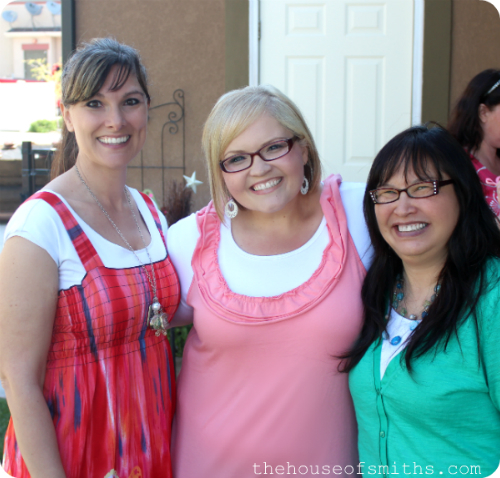 Cute Miss Annette from Washington, and her adorable sister Trena! We feel beyond lucky that so many of you were able and willing to invest your time and money into our garage sale this past Saturday, and also into our blog EACH DAY! No amount of hugs, thanks or "decor on the cheap" can express our love and appreciation to each and every one of you. Thanks for being the freakin'-awesomest fellow bloggers and readers that a girl and guy could ever ask for! Oh, I love it, Shelley!!!! Oh, to have a garage sale success such as yours is a dream of many!!! Great job in cleaning it out and making the days of some very happy people!!! Woah! That is absolute madness! Congrats on the successful sale! I would have LOVED to have gone, but alas I live to far away. I am glad to hear that it went well though. I can't believe that you pretty much sold out before 11! I also just have to say how amazing you are looking! I can really tell that you are working hard and doing a great job. Thats great!! I wish I lived near you! OH MY GOSH!! Did you sell your dining table and chairs??????? Darn, I'm so mad I had to miss that. I would have loved to pick up some of your stuff and meet you. Looks like a great turn out though! That's awesome! So glad it went well! I envy those who were able to attend. I swear I'm still plotting to buy the blog house! Shelly you are beautiful! Gorgeous in the last pic. I love your blog, I have been reading it for a few years. It is always beautiful and inspiring. so much fun! and of course you have the garage sale after I move from Nevada to Virginia! LOL! I would have hauled my little patootie up there! :) glad it went so darn well. Hooray! omg i've been following your blog for quite some time. and absolutely loooooove it. I Usually don't comment, but this is def comment worthy. WOW WHAT A REMARKABLE TURN OUT YOU HAD!!!! I've never seen a garage sale so successful!! Amazing job! It was so fun to come to the yard sale. I have never been to one with a line befor. Wow! We had so much fun driving around Day Break as we had not been there befor. It was beautiful. Thanks again for the fun morning. Honestly I almost rescheduled my weekend in st. george so I could make it to your sale! I know I would've found some treasures. Glad it was such a success! Can I just say how amazing you look?! i am following your journey and you are inspiring me every step of the way! Congratulations. Looks like it was alot of fun. I'm sure you were all pooped out after all that work. It's always nice getting rid of stuff but making others happy. You look a lot like Reese Witherspoon, do people tell you that?!? !